Let me run you through my pre-match loadout checks. 1) Check if I have a gun. 2) If yes, check if that gun has the pointy bit where the bullets come out. 3) Okay, I'm bored, let's just shoot something. 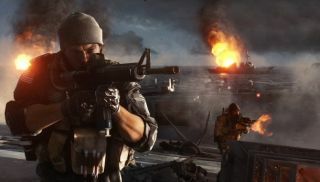 If you're a more militarily inclined player, who painstakingly compares grips, and thinks - regardless of logic - that a bit of camo painted on your gun will somehow make you invisible, then EA's latest Battlefield 4 feature video should be of interest. Strangely, the vehicle customisation - arguably a much more dramatic change in the game's customisation - is skimmed over in less detail. The video does have one final piece of information to reveal: "tiered reloading". The system remembers what stage of reloading you're at when you switch weapons, and will continue from that point when you switch back. In other words: what every FPS should probably be doing already, but for some reason isn't.